Dantez Walton (32) goes up for a shot during the game against Manhattan. Walton had 15 points on the game. 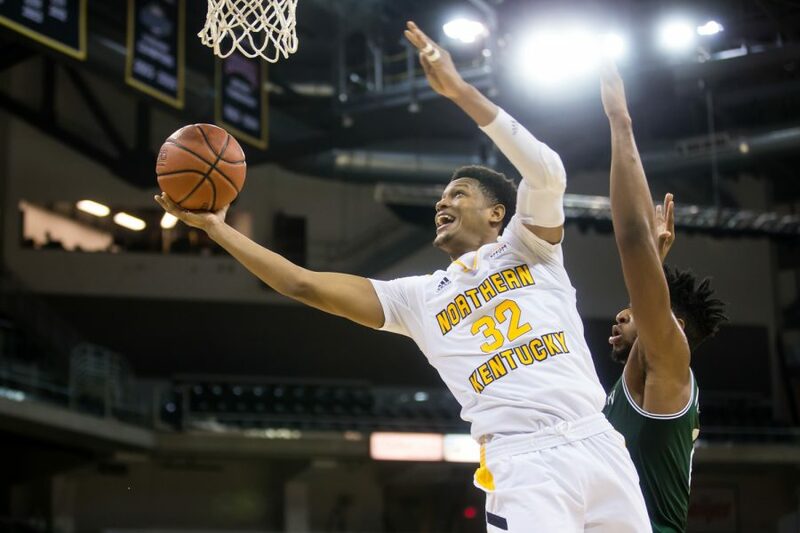 After pulling off a six-point margin victory against Manhattan on Saturday night, the NKU men’s basketball team remain undefeated (5-0) and in the driver’s seat in the KEMI Northern Kentucky Basketball Classic. Drew McDonald led the Norse with 19 points and eight rebounds, followed by Dantez Walton with 15 points and seven rebounds. Jalen Tate and Zaynah Robinson each had four assists, while Chris Vogt finished the game with a career-high eight rebounds. After winning the initial tip, the Norse started slower than usual and didn’t score until Walton drained a three just over two minutes into the half. The Norse would find their rhythm though after McDonald scored the tenth point from behind the arc and gained controlled after ending the half ahead 25-19. The Norse were held to 6-of-21 (28.6 percent) shooting from the field and failed to have a single player reach double-digits in scoring in the first half. The Norse doubled down in the post a few possessions in the second half to get some much needed momentum and led by as many as 17 points after Walton nailed a three with 6:30 remaining in the game. The Jaspers would rally back though and cut the lead to five after Thomas Capuano drained a three with 3:14 left on the clock. With the thunderous crowd on their feet and less than a minute remaining, the Norse were able to gain possession after stealing the ball and iced the game after being sent to the line. The Norse improved on their first half struggles by shooting 10-of-16 (62.5 percent) from the field and 7-of-10 (70 percent) from long range. The Norse will conclude the KEMI Northern Kentucky Basketball Classic against Coastal Carolina on Sunday, Nov. 18. Tip off is set for 6:30 p.m at BB&T arena and will be broadcasted on Fox Sports Ohio.